PSSH is supported on Python 2.4 and greater (including Python 3.1 and greater). It was originally written and maintained by Brent N. Chun. Due to his busy schedule, Brent handed over maintenance to Andrew McNabb in October 2009. Many people use SSH to log in to remote machines, copy files around, and perform general system administration. If you want to increase your productivity with SSH, you can try a tool that lets you run commands on more than one remote machine at the same time. Parallel ssh, Cluster SSH, and ClusterIt let you specify commands in a single terminal window and send them to a collection of remote machines where they can be executed. Why you would need a utility like this when, using openSSH, you can create a file containing your commands and use a bash for loop to run it on a list of remote hosts, one at a time? One advantage of a parallel SSH utility is that commands can be run on several hosts at the same time. For a short-running task this might not matter much, but if a task needs an hour to complete and you need to run it on 20 hosts, parallel execution beats serial by a mile. Also, if you want to interactively edit the same file on multiple machines, it might be quicker to use a parallel SSH utility and edit the file on all nodes with vi rather than concoct a script to do the same edit. Many of these parallel SSH tools include support for copying to many hosts at once (a parallel version of scp) or using rsync on a collection of hosts at once. Because the parallel SSH implementations know about all the hosts in a group, some of them also offer the ability to execute a command "on one host" and will work out which host to pick using load balancing. Finally, some parallel SSH projects let you use barriers so that you can execute a collection of commands and explicitly have each node in the group wait until all the nodes have completed a stage before moving on to the next stage of processing. The Parallel ssh project includes parallel versions of the shell (pssh), scp (pscp), rsync (prsync), and kill (pnuke). pssh is packaged for openSUSE as a 1-Click install, is available in Ubuntu Hardy Universe and the Fedora 9 repositories. I used the 64-bit package from the Fedora 9 repositories. All of the Parallel ssh commands have the form command -h hosts-file options, where the hosts-file contains a list of all the hosts that you want to have the command executed on. For example, the first pssh command below will execute the date command on p1 and p2 as the ben user. The optional -l argument specifies the username that should be used to log in to the remote machines. Normally the standard output from the remote hosts is not shown to you. The -P option in the last invocation displays the output from both remote hosts as well as the exit status. If you are running more complex commands you might like to use -i instead to see each remote host's output grouped nicely under its hostname rather than mixed up as the output comes in from the hosts. You can also use the --outdir pssh option to specify the path of a directory that should be used to save the output from each remote host. The output for each host is saved in separate file named with the remote machine's hostname. You can use the --timeout option to specify how long a command can take. It defaults to 60 seconds. This means that if your command fails to complete within 60 seconds on a host, pssh will consider it an error and report it as such, as shown below. You can increase the timeout to something well above what might be acceptable (for example to 24 hours) to avoid this problem. The pscp command takes the same -h, -l, and --timeout options and includes a --recursive option to enable deep copying from the local host. At the end of the command you supply the local and remote paths you would like to copy. The first pscp command in the example below copies a single file to two remote hosts in parallel. The following ssh command checks that the file exists on the p1 machine. The second pscp command fails in a verbose manner without really telling you the simple reason why. Knowing that I was trying to copy a directory over, I added the --recursive option to the command and it executed perfectly. The final ssh command verifies that the directory now exists on the p1 remote host. The prsync command uses only a handful of the command-line options from rsync. In particular, you cannot use the verbose or dry-run options to get details or see what would have been done. The command shown below will rsync the example-tree into /tmp/example-tree on the remote hosts in a manner similar to the final command in the pscp example. The main gain of the prsync command over using the normal rsync command with pssh is that prsync gives a simpler command line and lets you sync from the local machine to the remote hosts directly. Using pssh and rsync, you are running the rsync command on each remote machine, so the remote machine will need to connect back to the local machine in order to sync. The pslurp command is sort of the opposite to the pscp in that it grabs a file or directory off all the remote machines and copies it to the local machine. The below command grabs the example-tree directory from both p1 and p2 and stores them into /tmp/outdir. The -r option is shorthand for --recursive. As you can see, for each remote host a new directory is created with the name of the host, and inside that directory a copy of example-tree is made using the local directory name supplied as the last argument to pslurp. You can use environment variables to make things easier with Parallel ssh. You can use the PSSH_HOSTS variable to name the hosts file instead of using the -h option. Likewise, the PSSH_USER environment variable lets you set the username to log in as, like the -l pssh command line option. pssh provides a number of commands for executing against a group of computers, using SSH. It’s most useful for operating on clusters of homogenously-configured hosts. where the hosts-file contains a list of all the hosts that you want to have the command executed on. By default, pssh uses at most 32 ssh processes in parallel to ssh to the various nodes. (This is somewhat important if you’re controlling hundreds or thousands of machines.) 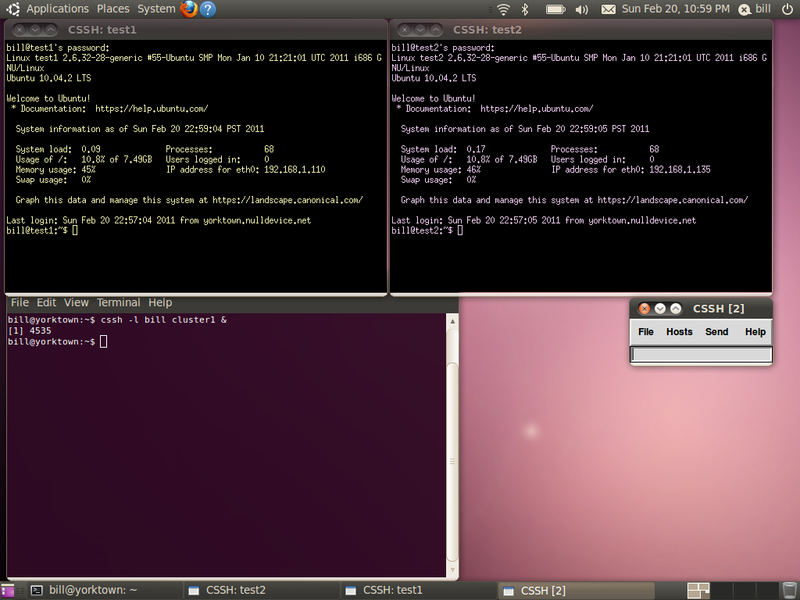 By default, it also uses a timeout of one minute to ssh to a node and obtain a result. For ssh commands that take longer than this (e.g., sleep 61), the -t option can be used. Note that pssh and pnuke have a default timeout of one minute. pscp and prsync have no default timeout, but one can be specified using the -t option. Here’s an example of using pscp to copy files in parallel to a set of machines. Looks like -h option is slightly more convenient then -w option. "... Each line in the host file are of the form [user@]host[:port] and can include blank lines and comments lines beginning with "#". ..."
First you need to create a text file called hosts file from which pssh read hosts names. The syntax is pretty simple. Each line in the host file are of the form [user@]host[:port] and can include blank lines and comments lines beginning with "#". If you're a Linux system administrator, chances are you've got more than one machine that you're responsible for on a daily basis. You may even have a bank of machines that you maintain that are similar -- a farm of Web servers, for example. If you have a need to type the same command into several machines at once, you can login to each one with SSH and do it serially, or you can save yourself a lot of time and effort and use a tool like ClusterSSH. ClusterSSH is a Tk/Perl wrapper around standard Linux tools like XTerm and SSH. As such, it'll run on just about any POSIX-compliant OS where the libraries exist -- I've run it on Linux, Solaris, and Mac OS X. It requires the Perl libraries Tk ( perl-tk on Debian or Ubuntu) and X11::Protocol ( libx11-protocol-perl on Debian or Ubuntu), in addition to xterm and OpenSSH. Installing ClusterSSH on a Debian or Ubuntu system is trivial -- a simple sudo apt-get install clusterssh will install it and its dependencies. It is also packaged for use with Fedora, and it is installable via the ports system on FreeBSD. There's also a MacPorts version for use with Mac OS X, if you use an Apple machine. Of course, it can also be compiled from source. ClusterSSH can be configured either via its global configuration file -- /etc/clusters , or via a file in the user's home directory called .csshrc . I tend to favor the user-level configuration as that lets multiple people on the same system to setup their ClusterSSH client as they choose. Configuration is straightforward in either case, as the file format is the same. ClusterSSH defines a "cluster" as a group of machines that you'd like to control via one interface. With that in mind, you enumerate your clusters at the top of the file in a "clusters" block, and then you describe each cluster in a separate section below. By calling out the "all" cluster as containing cluster1 and cluster2, if either of those clusters ever change, the change is automatically captured so you don't have to update the "all" definition. This will save you time and headache if your .csshrc file ever grows in size. Using ClusterSSH is similar to launching SSH by itself. Simply running cssh -l <username> <clustername> will launch ClusterSSH and log you in as the desired user on that cluster. In the figure below, you can see I've logged into "cluster1" as myself. 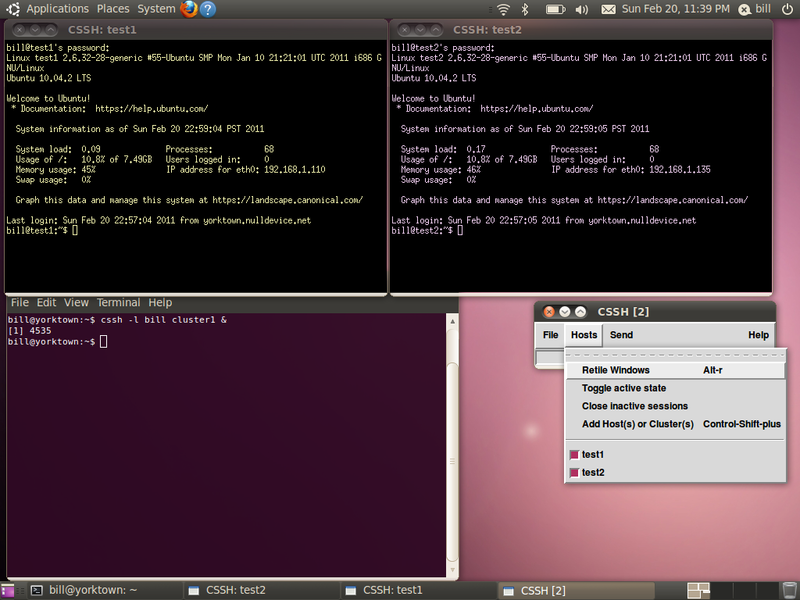 The small window labeled "CSSH " is the Cluster SSH console window. Anything I type into that small window gets echoed to all the machines in the cluster -- in this case, machines "test1" and "test2". In a pinch, you can also login to machines that aren't in your .csshrc file, simply by running cssh -l <username> <machinename1> <machinename2> <machinename3> . If I want to send something to one of the terminals, I can simply switch focus by clicking in the desired XTerm, and just type in that window like I usually would. ClusterSSH has a few menu items that really help when dealing with a mix of machines. As per the figure below, in the "Hosts" menu of the ClusterSSH console there's are several options that come in handy. "Retile Windows" does just that if you've manually resized or moved something. "Add host(s) or Cluster(s)" is great if you want to add another set of machines or another cluster to the running ClusterSSH session. Finally, you'll see each host listed at the bottom of the "Hosts" menu. By checking or unchecking the boxes next to each hostname, you can select which hosts the ClusterSSH console will echo commands to. This is handy if you want to exclude a host or two for a one-off or particular reason. The final menu option that's nice to have is under the "Send" menu, called "Hostname". This simply echoes each machine's hostname to the command line, which can be handy if you're constructing something host-specific across your cluster. Like many UNIX tools, ClusterSSH has the potential to go horribly awry if you aren't very careful with its use. I've seen ClusterSSH mistakes take out an entire tier of Web servers simply by propagating a typo in an Apache configuration. Having access to multiple machines at once, possibly as a privileged user, means mistakes come at a great cost. Take care, and double-check what you're doing before you punch that Enter key. ClusterSSH isn't a replacement for having a configuration management system or any of the other best practices when managing a number of machines. However, if you need to do something in a pinch outside of your usual toolset or process, or if you're doing prototype work, ClusterSSH is indispensable. It can save a lot of time when doing tasks that need to be done on more than one machine, but like any power tool, it can cause a lot of damage if used haphazardly. Run the same command at the same time on multiple systems, simplifying administrative tasks and reducing synchronization problems . If you have multiple servers with similar or identical configurations (such as nodes in a cluster), it's often difficult to make sure the contents and configuration of those servers are identical. It's even more difficult when you need to make configuration modifications from the command line, knowing you'll have to execute the exact same command on a large number of systems (better get coffee first). You could try writing a script to perform the task automatically, but sometimes scripting is overkill for the work to be done. Fortunately, there's another way to execute commands on multiple hosts simultaneously. A great solution for this problem is an excellent tool called multixterm , which enables you to simultaneously open xterms to any number of systems, type your commands in a single central window and have the commands executed in each of the xterm windows you've started. Sound appealing? Type once, execute many-it sounds like a new pipelining instruction set. This command will open ssh connections to host1 and host2 ( Figure 4-1 ). Anything typed in the area labeled "stdin window" (which is usually gray or green, depending on your color scheme) will be sent to both windows, as shown in the figure. As you can see from the sample command, the –xc option stands for execute command, and it must be followed by the command that you want to execute on each host, enclosed in double quotation marks. If the specified command includes a wildcard such as %n , each hostname that follows the command will be substituted into the command in turn when it is executed. Thus, in our example, the commands ssh host1 and ssh host2 were both executed by multixterm , each within its own xterm window. Q. I have heard that pssh and clusterssh are two popular ones, but I thought I would open it to discussion here and see what the community's experiences with these tools were? What are the gotchas? Any decent hacks or use cases? A: I have used pssh and it's easy and works quite well. It's really great for quick queries. If you find yourself managing servers I'd suggest something more robust and in a slightly different realm (configuration management) such as Puppet or CFEngine. There is also dsh for parallel ssh runs. Mussh is a good alternative, it is already included in many Linux distros. The SSH Power Tool (sshpt) was designed for parallel SSH without requiring that the user setup pre-shared SSH keys. It is superior to pssh and clusterssh in that it supports executions via sudo and can also copy files and execute them afterwards (optionally, via sudo as well). By default it outputs results in CSV format but sshpt.py doubles as an importable Python module so you can use it in your own programs (I used to use it as a back-end behind a a custom-built web-based reporting tool at my former employer). PSSH was originally written and maintained by Brent N. Chun. Due to his busy schedule, Brent handed over maintenance to Andrew McNabb in October 2009. OpenSSH is perhaps one of the most powerful and versatile tools available to any Linux user. It allows you to securely connect to a remote system via a shell or encrypted FTP and also allows you to copy files securely to and from remote systems. For a user caring for multiple systems, OpenSSH is extremely useful, but being able to execute OpenSSH commands in parallel is even more so. This is where Parallel SSH, or pssh, comes in. Pssh provides parallel versions of the OpenSSH tools, meaning you can execute commands on various hosts in parallel, copy files in parallel, and so forth. Pssh is essentially a frontend to OpenSSH written in Python. It includes pssh, pscp, and prsync, as well as pslurp (the opposite of pscp in that it downloads rather than uploads) and pnuke (a frontend to the kill command). Using pssh is extremely easy. There are no manpages, but calling the command with no arguments will bring up the help, which describes each option.